Happy Valentine’s Day! Whatever term you like to define your relationship status, nothing hits the spot more on this day than chocolate. YES.. CHOCOLATE! I’d been brainstorming for two weeks beforehand about what to bake. I initially wanted something red velvet, not cookies (seen here last year) and made from scratch. 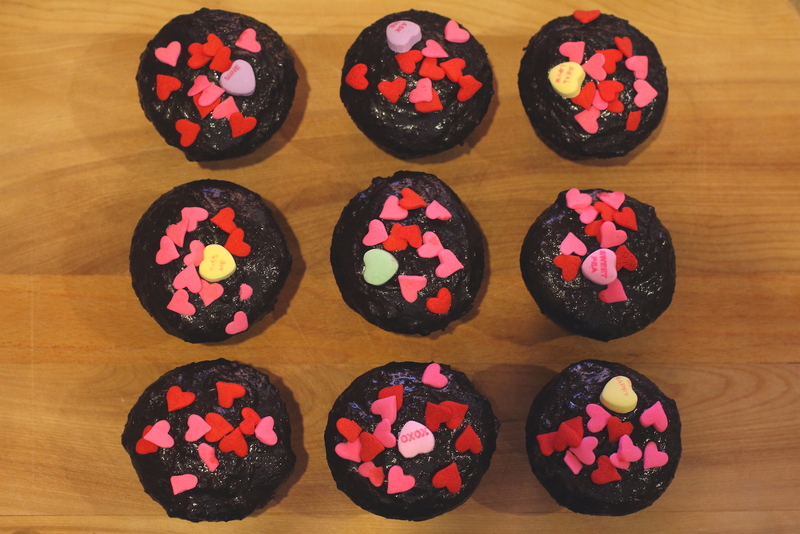 However I didn’t have enough time to research about using food coloring so I ended up making chocolate cupcakes. After more contemplation and research on chocolate cupcake recipes, I decided to use one from a baking book I bought last Christmas. 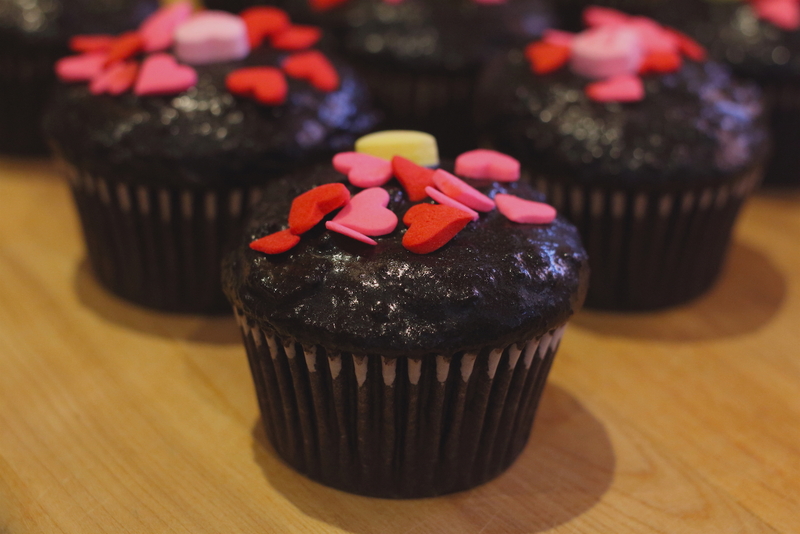 The cupcakes are indeed moist and quite delicious! Have a wonderful day as I try to stay warm on this cold cold winter day. 2. In a large heatproof mixing bowl, carefully whisk together the sugar, flour, cocoa powder, baking soda, and salt until there aren’t any whisk lumps. Crack in the egg, spoon in the sour cream, and pour in the oil and vanilla. Briefly mix with a wooden spoon or silicone spatula just until smooth and combined. 3. Pour in the boiling water and slowly mix, starting from the center and working your way outward (this trick makes it easy to mix without splattering batter everywhere). The batter will be quite liquid, but this is normal. 4. Divide the batter evenly among the lined cups, using the silicone spatula to assist with bowl scraping. Fill each cup about halfway with 3 Tbsp batter. 5. Bake for 15 to 19 minutes (being sure to carefully rotate the pans halfway through baking), until a cake tester or a wooden toothpick inserted into center of a cupcake comes out clean. 6. Transfer the pans to wire racks for about 10 minutes, until the pans are cool to the touch. Remove the cupcakes and transfer them to the racks. 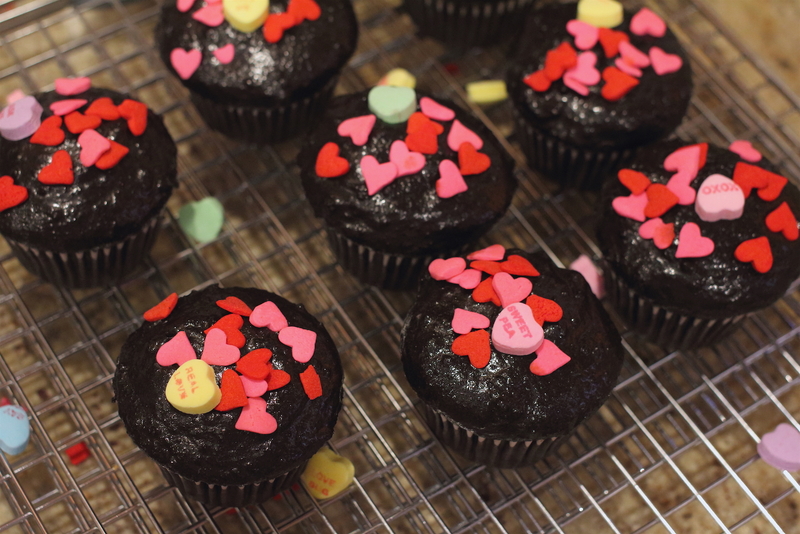 Let the cupcakes cool completely before frosting them and decorating. 1. In a large bowl using a handheld mixer or in the bowl of a stand mixer fitted with the paddle attachment, combine the butter and cocoa powder until smooth. 2. Now alternately mix in the milk and confectioners’ sugar to achieve a spreading consistency. Mix in the corn syrup and vanilla. Add another 1 Tbsp or so of milk or confectioners’ sugar if necessary to adjust the consistency. 3. Allow the frosting to sit 10 minutes to thicken a bit, and use as needed.